2 of 6 Gently lift skin from breasts and legs and season each chicken with 1 teaspoon Montreal seasoning. Place some of the lemon and garlic slices under the skin. 3 of 6 Place chickens on a rack in a large roasting pan. Roast at 450 degrees F for 30 minutes. 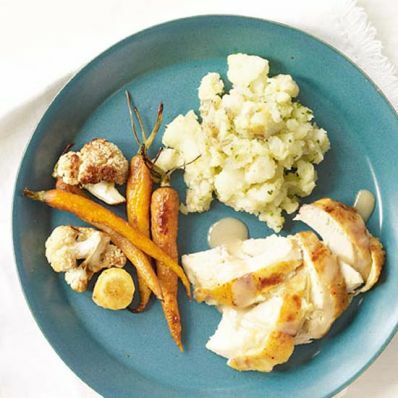 Reduce temperature to 350 degrees F. Roast for 50 minutes or until internal temperature registers 165 degrees F.
4 of 6 Meanwhile, place vegetables on a large rimmed baking sheet and toss with olive oil and remaining teaspoon Montreal seasoning. Place in the 350 degrees F oven and roast for about 45 minutes or until tender. Stir after 25 minutes. 6 of 6 roasting pan and whisk in flour. Cook over medium-high heat for 1 minute; whisk in chicken broth and 1/2 cup water. Simmer 3 minutes until thickened, scraping browned bits from bottom of pan. Strain.